Vision -the last ArtLoveMagic Show of 2008- was dope. each piece in the show sported a one-word title it exemplified. i hung 2 pieces in the gallery (my theme was Motherhood) and did sketches and brought greeting cards and postcards for the people. there were lots of other artists of all types on hand. all the ArtLoveMagic events i've done have been heavily attended and this one was no different. 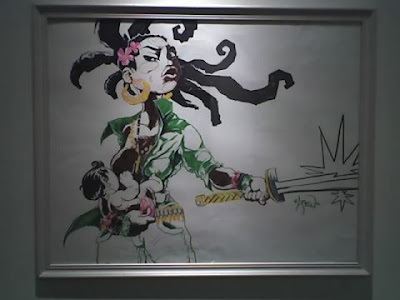 The exhibit (including the piece shown here-which has already sold) will be up through Thanksgiving Weekend at the Mokah Art Gallery just off Canton and Malcom X in Dallas. 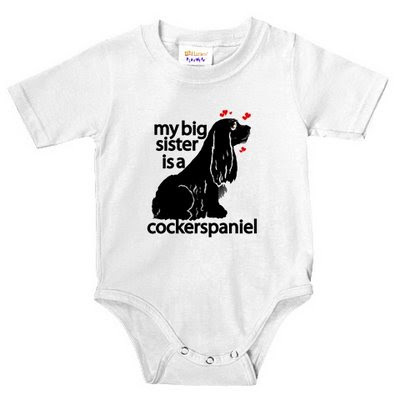 i already started on my Christmas gifts this year... my daughter's very first yuletide gift from Dad will be this fresh "My Big Sister is a Cockerspaniel" bodysuit, illuminating her relationship to my wife's beloved Cockerspaniel, Millie. they are available in white, pink and baby blue in the Ziontific online store. they also come in "My Big Brother..." and "My First Baby..." varieties for just $12.99, with other gifts for lovers of Cockerspaniels too, so happy shopping!